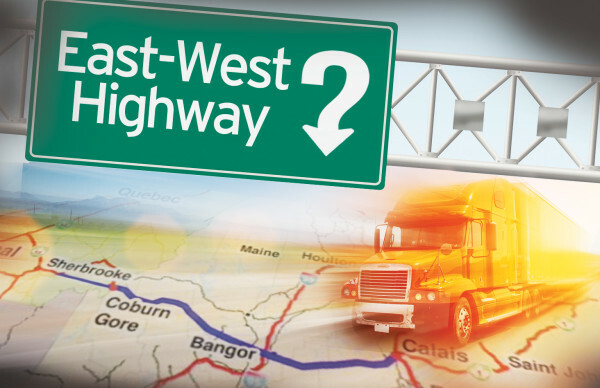 PITTSFIELD, Maine — The proposal to build a $2.1 billion, privately funded east-west highway connecting two Canadian provinces through Maine is not dead, just on the back burner, a spokesman for the plan’s main proponent said Monday. Company workers are still “spending some time on this determining where the best routing possibilities would lie,” he said. That’s about the extent of their efforts, he said. Proponents and opponents agreed that the project is at least dormant. “I would say it is in the slow lane, maybe the breakdown lane, certainly not the fast lane,” said Jym St. Pierre, Maine director of Restore: The North Woods, an environmental group that opposes the plan. Maine Department of Transportation spokesman Ted Talbot said that as far as state officials are concerned, the highway plan “is on the same shelf it was on when it was shelved the last time,” in May 2013. That’s when the Legislature’s Transportation Committee voted unanimously to repeal a $300,000 Maine DOT feasibility study of the highway in response to intense opposition, effectively killing any momentum the project might have developed. The “investor-grade” study would determine for investors whether the highway would be worth the expense, and give state officials a basis for future east-west highway planning, Thomas said. The idea had been kicking around Maine for decades when Cianbro president Peter Vigue began promoting his company’s take on it in 2007. He said the 220-mile private highway would bisect Maine from Calais to Coburn Gore, connecting Canada’s Maritime Provinces with Quebec. Messages left for Vigue seeking comment for this story were not returned. He has previously said that the highway would help Maine take advantage of its location by improving connectivity of eastern Canada and the interior United States with Atlantic trade routes to Europe and Asia, while drawing millions of dollars in investment and creating thousands of jobs. It would be, he said, a particular boost for rural Maine communities devastated by the loss of traditional manufacturing and resource-based jobs. But details about the highway, including its exact route, have been scarce, and environmental groups, small-business owners and residents of communities that could be affected by the project have opposed the plan through several legislative measures. One environmentalist claimed that it would cross or be in the viewshed of more than five dozen significant conservation and recreation areas. Nine municipalities have passed ordinances or regulations opposing or requiring their approval of the highway. They are Abbott, Charleston, Dexter, Dover-Foxcroft, Garland, Monson, Parkman, Sangerville and Wellington, said Chris Buchanan, statewide coordinator of Stop The East-West Corridor. The towns, in general, fear losing the land needed to build the highway and the effects on their businesses and property values if it is constructed. The opposition to it was among the things that made the study proposal easy for legislators to reject. Legislators assumed the public end of the public-private partnership would involve the state sinking tens to hundreds of millions of dollars into the highway, an unpalatable notion, said state Sen. Edward Mazurek, D-Rockland, former chairman of the Transportation Committee, the body that would take up a revised or resubmitted bill. The highway’s proponents appear to be keeping the issue under the radar, if they are dealing with it at all. Gov. Paul LePage, who conditionally supports the project, hasn’t made any public statements about it recently. His spokeswoman, Adrienne Bennett, did not return a recent email message. A spokeswoman for Eastern Maine Development Corp., another project proponent, declined to comment on it. David Cole, a transportation consultant and former Maine Department of Transportation commissioner, said he is unaware of any promotion of the proposal occurring recently, while Sidney Mitchell, secretary to the Friends of the Piscataquis Valley group that opposes the project, said that group members hope to work with legislators this spring to disassemble parts of the laws that allow public-private partnerships. Cole, who was DOT commissioner when Vigue began promoting the idea in 2007, supports improving northern Maine’s infrastructure, but said he thinks the state has a bigger opportunity to improve its east-to-west transportation infrastructure in the near future with its port-to-rail connections. Cole made a point that the state’s three gubernatorial candidates offered when the plan was discussed prior to the November election — that too little was known about the plan to determine whether it should be endorsed. “I think at this point there are still a lot of unknowns about how a highway would work. Those questions would have to be answered and again, that’s something that needs a lot of public support,” Cole added. Buchanan said she wished the idea would disappear. Thomas, Cole and St. Pierre said they don’t see the project going away. They assume that Vigue and other proponents continue to work on it privately. The study bill could be revived publicly, Talbot said, by legislative action or upon LePage’s request. BDN writers Alex Barber, Robert Long, and Mario Moretto contributed to this report.